Laurie moved back to Detroit from Florida to help care for her father who has suffered three strokes. She is unable to work due to her father's constant attention, so she tries to raise money by standing at freeway exit ramps for a few hours a day, holding a sign that explains her need for donations. She raises enough money to at least pay for his daily supply of disposable diapers. 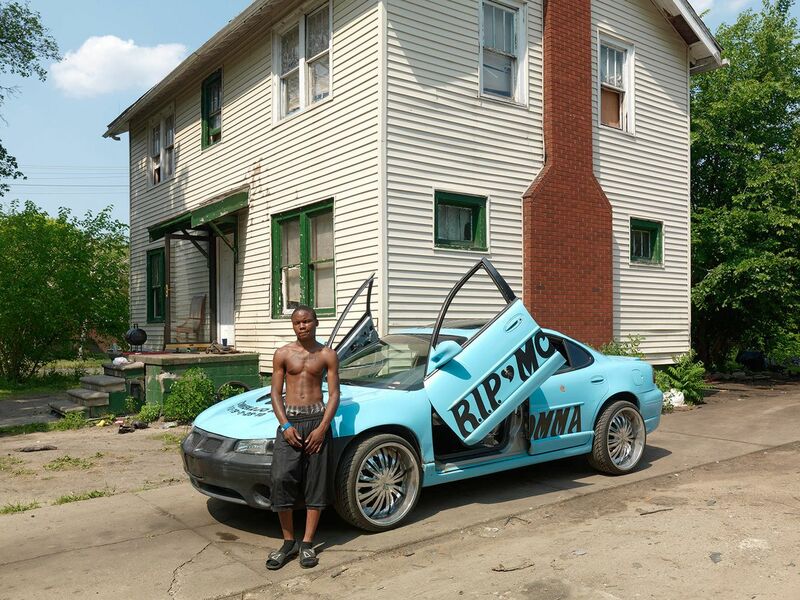 A young man stands in front of the car memorializing the death of his mother who died from an asthma attack at the age of 34. Two brothers who have tattoos on their chests memoralizing the death of their mother who died from an asthma attack at the age of 34. 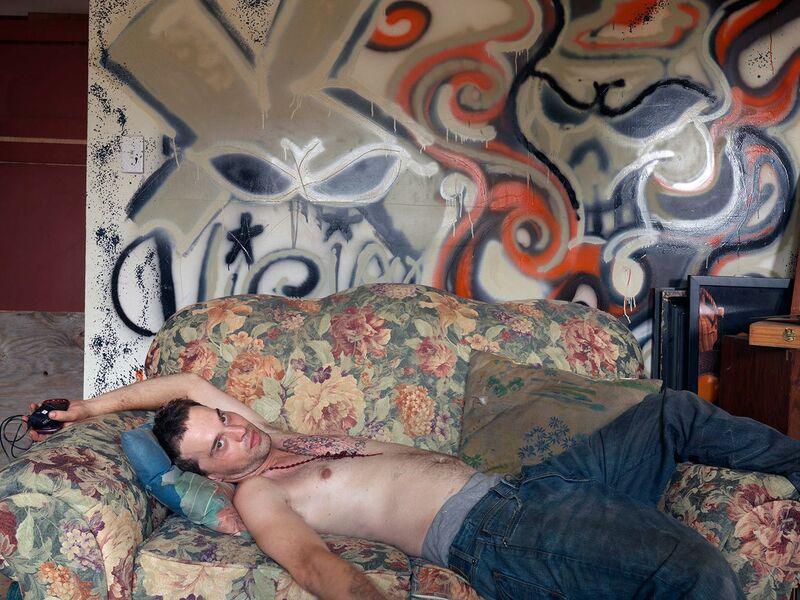 Beezy is sitting in the livingroom of an abandoned house he took over on Goldengate Street in November of 2011. He has done extensive work on the house by replacing doors, windows, and drywall from materials that were donated to him. Collectively, he lives and works with a group of like minded people who have taken over a half dozen abandoned houses on the street. They repair the houses, cook community meals, garden, raise chickens, and share in the domestic well being of the community. Their efforts are a positive change for one of the most decimated and blighted areas in Detroit. In 2015 the city condemned the house and raised it. 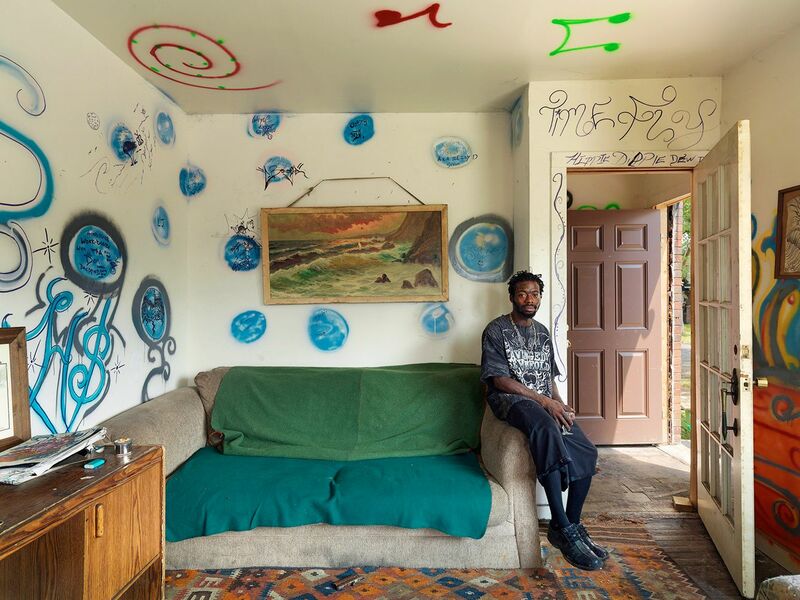 Clifford lives in one of the rooms of Beezy's house on Goldengate Street. Shawn lives in the "bottle house" on Goldengate Street, so named for the empty window openings which have been filled in with glass bottles held together with straw and mud. The temperature hit 103 degrees on this July day, forcing many neighborhood residents to illegally open up fire hydrants to relieve themselves from the sweltering heat, putting additional stress on the fire departments already dwindling resources. A family returns to have their portrait taken while standing on the pitchers mound at the location of the old Tiger Stadium which stood on the corner of Michigan Avenue and Trumbull. Efforts by several preservationist organizations failed to save the 100 year old wooden structure which was demolished in 2009. All that is left is the baseball diamond and the original flag pole. Deborah moved to Detroit five years ago from Bloomington, IN to start a new life. She raises chickens, angora rabbits, bees, and grows all of her own vegetables on her property in the Jefferson-Chalmers neighborhood. Apprehensive at first about moving to Detroit, she now says it's the best move she ever made and has connected with many urban farmers within the city. She also performs duties as a nanny for a wealthy family in neighboring Grosse Pointe, Michigan. Jack rabbit, as he likes to be called is a retired Detroit policeman. A forty-five year resident of the Jefferson-Chalmers neighborhood, he is now the local crime stopper. He keeps a lookout for suspicious activity and sets up survalence posts to catch criminals in the act. His efforts have paid off as the neighborhood has the lowest crime rate in the city. Jack Rabbit is one of the main characters in Andrew James' documentary film "Street Fighting Man" due to release late in 2012. Andrea and her husband Jesus recently purchased this empty two story building and established a spanish speaking church with about 20 members. They will live upstairs in the apartment and hold services in the storefront. Jesus doesn't speak a word of English, but he does offer an English speaking translator for those who attend his church and cannot speak Spanish. One of a half dozen locations around the city where a group of volunteers have made small book racks to help with neighborhoods that have had their local libraries closed. Charles is homeless and has been living in the abandoned Packard Plant for the past year and a half. 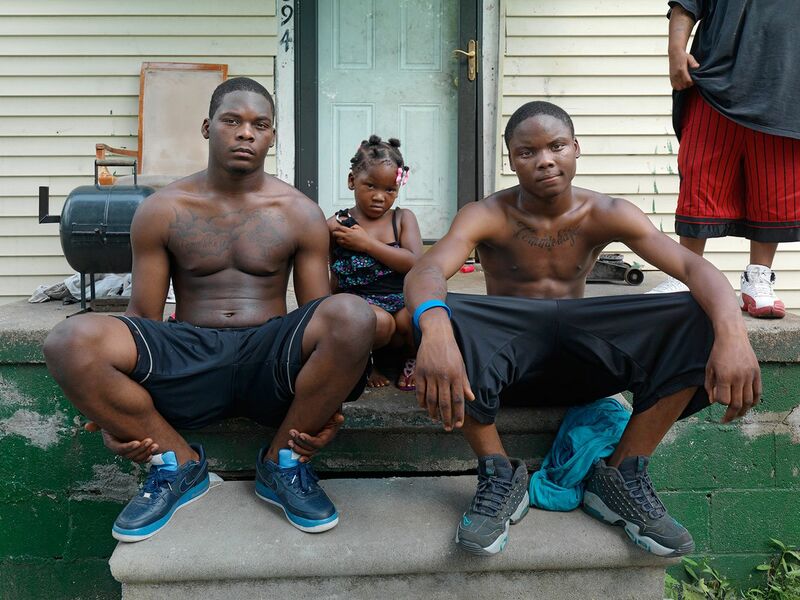 He grew up only a couple of blocks away but his boyhood home has been torn down. He keeps a scrapbook that chronicles national and world news events such as the death of Pope John Paul II and the trial of OJ Simpson. To what extent he uses these I do not know, but they do offer some degree of comfort for him. Two guys standing in the street near an opened fire hydrant on a 103 degree day. A young boy spends the day with his mother who sells slushies from a vending cart on Vernor Street. Mo opened this tire shop located on busy Michigan Avenue in the spring of 2012, and while business has been slow, his hopes are high that things will pick up. He says that "Detroit is dead and no one has any money. Things have got to change or there won't be anything left". Bernadette has lived in this house for the past 28 years but the city has placed structural violations on the house and have given her until October to fix the house or be evicted. A widower who makes $5.00 an hour as a part-time crossing guard, she is unable to afford the repairs and is afraid that she will be forced into homelessness. Her unemployed son and two grandchildren live with her as well. Abandoned for over 40 years, the roof finally collapses under its own weight at the Packard Automotive Plant. I don't like showing photographs of Detroit's ruined factories, but on my birth certificate it states that my father was employed at this plant as a metal shop worker in 1948, just before he started working for General Motors. More than any other automotive site in Detroit, the Packard Plant holds the most reverence among Detroiters'. I'm relieved that my father didn't live long enough to witness this. Robert is a freelance music producer but has had few job opportunities lately. Living in his deceased parents house but with no running water or heat, he was forced to spend the winter months on the streets of L.A. last year to get away from the cold. He boarded up the first floor windows to his parents house before he left, but that was a signal to looters that the house was empty, so they broke in, ransacked the house, and stole the hot water heater and several copper pipes, which flooded the basement. The city then sent him a $4,000 water bill. Henry performs as a street robot entertainer and also moonlights as a James Brown impersonator. Adam is a second generation shop owner. He and his father run a small tire repair shop on the corner of Tuxedo and Junction Street. On his roof are hundreds of discarded wheel rims which he's been collecting, presumably to recycle. Mike, a life-long Detroiter with two of his sons, Eric and Daniel in front of their house. Julie, who is expecting her second child, lives with her husband Randall, their son Oscar, and Princess, a three legged Pitt bull, in a 12,000 square foot industrial building on the southeast side of town. Randall is a potter who specializes in throwing small clay pots, which has become his signature style. He estimates that he's made at least 10,000 pots over the last thirty years and no two are alike. Several articles of clothing are left on a fence after a free clothing give away.